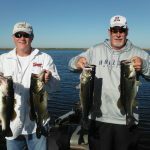 This was an 8 hour trip with Rod Cook and his buddy Dave Chanberlein from Vail, AZ. We caught over 75 fish with the biggest being 7lbs. Here is a picture of some of the fish they caught.